The emperor was entitled to have a Household, a real one as well as one "for show" composed of the High Offices of the Empire (Erzämter, archiofficia). The four High Offices appear under the Ottonian dynasty: at the coronation of Otto I in 936, each of the Stammherzöge held one of the functions. The Golden Bull of 1356 assigned them to the lay electors (in fact, some electors may have become so because they were High Officers). After a new electorate was created for the count Palatine, a new office of Arch-Treasurer was created for him, in 1652. 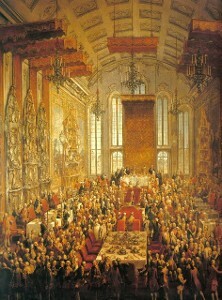 In 1706, after Bavaria was banned, the elector palatine resumed his office of Arch-Steward, and the office of Arch-Treasurer passed in 1710 to the newly created elector of Hanover. 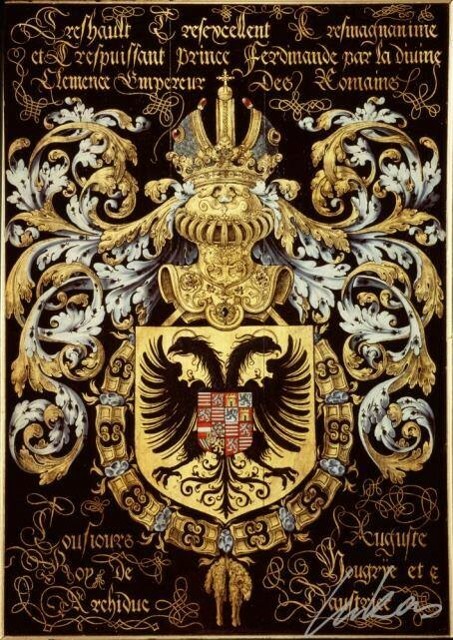 In 1714, Bavaria was reinstated, and the elector palatine resumed the office of Treasurer, but Hanover continued to use the title and augmentation of arms until the merger of the Bavarian and Palatine electorates in 1777 allowed Hanover to exercise the office. New offices were planned but never chosen for the electors created in 1803. The hereditary lands of Austria (Upper and Lower Austria, Styria, Carinthia, Krain, Tirol, Salzburg, Bohemia) each had their own hereditary officers of the household as well: in the following table, the names of the officer-holders for Austria and their heraldic augmentation, if known, are listed as well. The corresponding offices in the French Royal household were distinguished by external ornaments rather than augmentations to the coat of arms.